Weather-wise, you may have heard the expression, "March comes in like a lion and goes out like a lamb." The origin of this lion-lamb maxim may come from constellations. 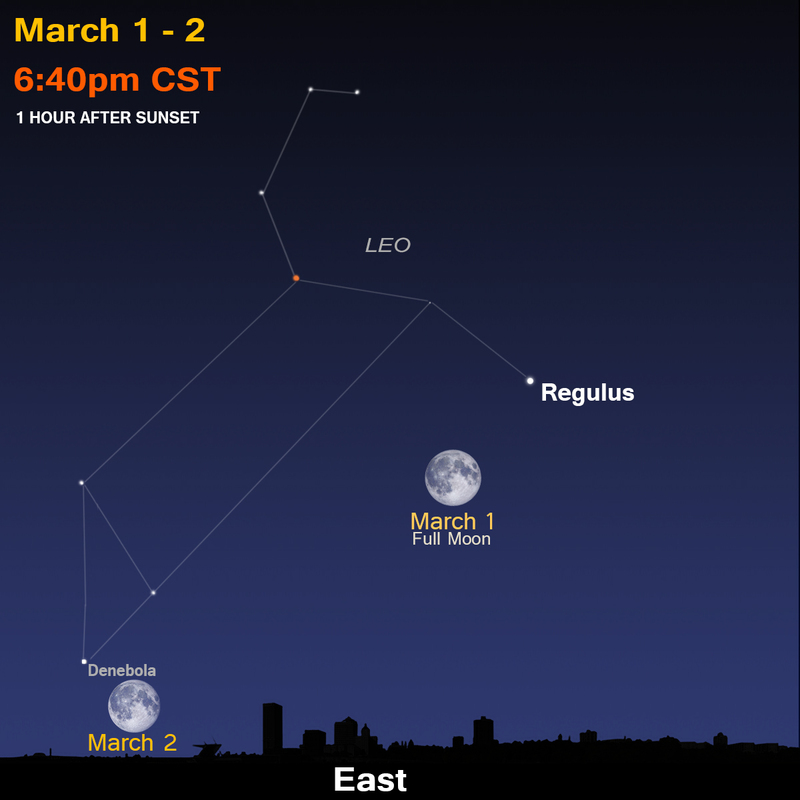 If you step outside and look east in early March, you can easily spot Leo the Lion—looking like a backwards question mark. (Some call it the “sickle.”) Observe the Moon nearby on the nights of March 1 and 2 to help you find Leo. 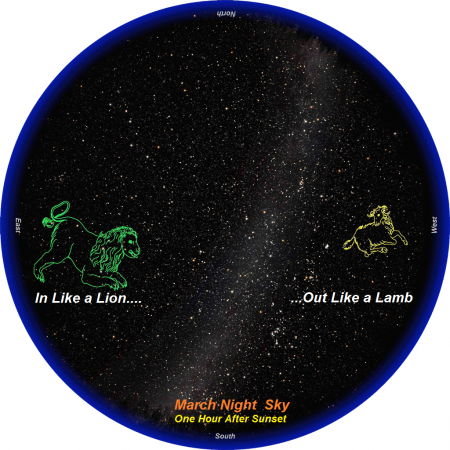 Directly opposite in the western sky, you can catch Aries the Ram, or Lamb. Look below the Pleiades star cluster and discover two fairly bright stars—Hamal and Sheratan. 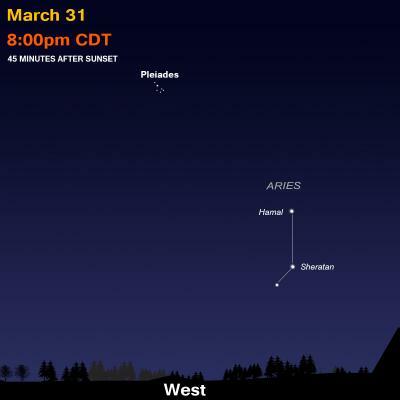 By March 31, Aries disappears quickly in the west after sunset. Now think of March weather; it’s definitely a changeable month. It starts out rough, with snowstorm potential, and it’s still pretty cold out there, especially if the wind kicks up. By the end of March, it has warmed up considerably; spring has officially started and we enjoy over 12 hours of daylight. Snow chances are lessened. Average high temperature is almost 50 degrees Fahrenheit in southern Wisconsin. A few flowers are even starting to bloom. So, does the rising of Leo at sunset represent the fierce weather at March’s start -- “In like a lion”? 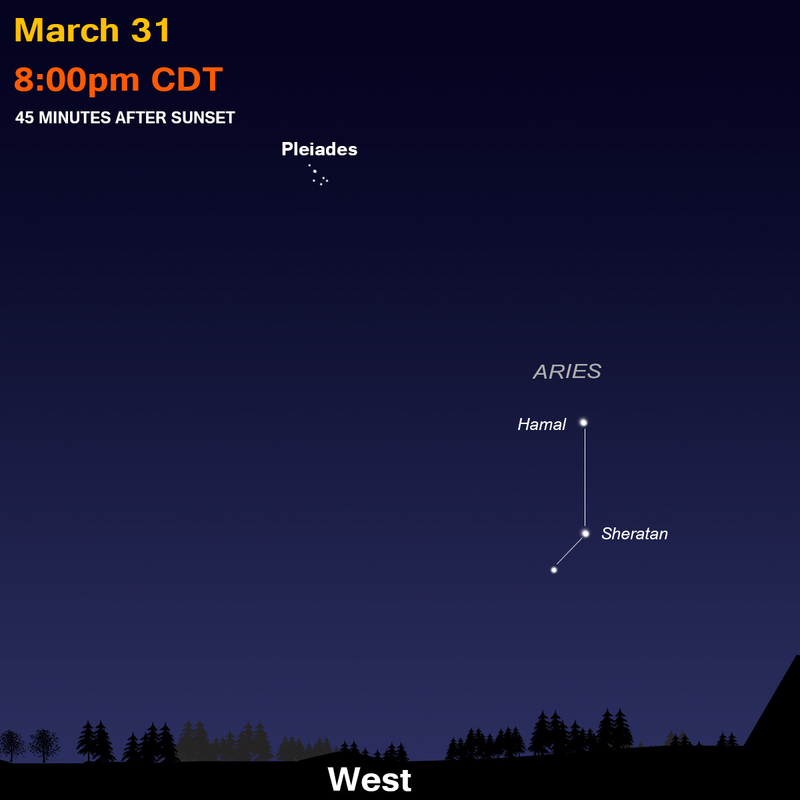 Does the disappearance of Aries soon after sunset correspond to the calmer weather at March’s end – “Out like a lamb”? “In like a lion and out like a lamb” sure seems appropriate. Perhaps the description does indeed descend from the two zodiac constellations in the sky. Our pupils are fairly small—less than a quarter inch wide. When we enter a dark room, our pupils dilate, or expand; this helps us see in the dark a little better. It may even stop us from stubbing our toe! 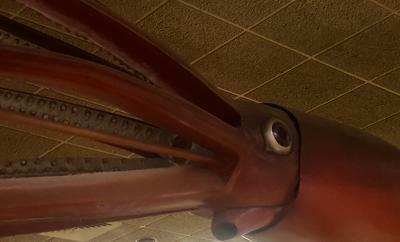 Imagine if our eyes were the size of a giant squid, about 10 inches across, like the one at MPM. We’d all have great eyesight. But with so much light and energy coming in, we’d need some major sunglasses—quick! The giant squid lives in deep, dark water. Its big eyes are a necessity to find food and survive. A telescope is like a big eye. For the solar eclipse last August, we enlarged our view with a 12-inch telescope -- bigger than the giant squid. 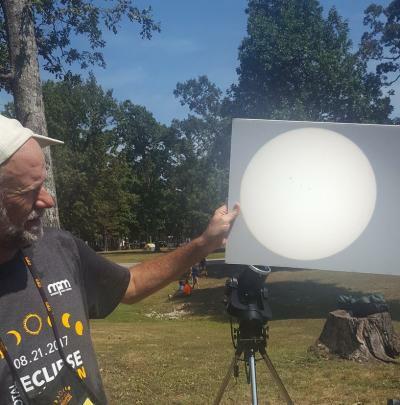 Sun spots became visible before totality as we projected the Sun’s light onto a big sheet of white cardboard. 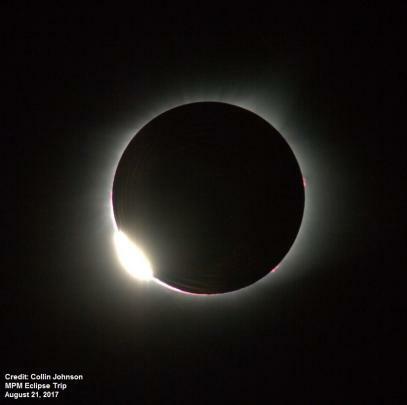 When the Moon completely covered the Sun, we gasped on the ruby prominences and ghostly corona. While most amateur telescopes provide stunning views of the heavens, they pale in comparison to the enormous, sophisticated telescopes on mountains--or in space above our atmosphere. They reveal deep space. If you held out one tiny grain of sand against the sky, our telescope would reveal around 10,000 galaxies. This photo by the Hubble Space Telescope is an astounding collection of hundreds of galaxies tied together by the mutual pull of gravity. 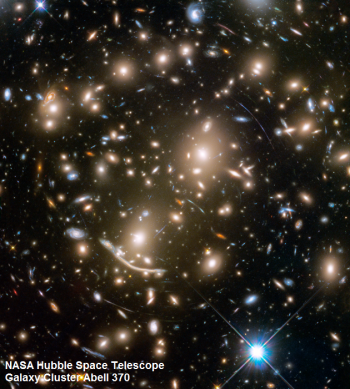 Intertwined with these galaxies, you might notice many elongated blue arcs. These are even more remote galaxies whose light is being stretched by the gravity well created by the cluster of galaxies in the foreground. These giant light collectors prove emphatically—there’s more than meets the eye. The Hubble Space Telescope is still doing great. However, no one at NASA is planning on another tune-up. After five check-up and repair missions, they’re done; Hubble is on its own. It’s like an old, lovable car -- too beat up to fix, but you’re going to drive it until it fails. The last time astronauts went up to give Hubble an upgrade was 2010—almost 8 years ago. Could your car run that long without some tender care? Overall, Hubble’s been working fantastically for 28 years. Estimates vary, but it should last another four years, according to a NASA report last year. 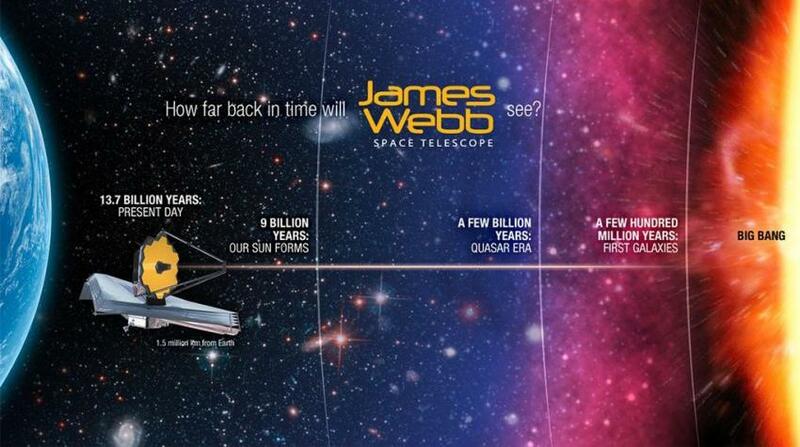 Seen often as its replacement, NASA’s James Webb Space Telescope (JWST) is scheduled for launch in 2019. The new huge space eye will extend our vision even further. It is expected to see the first stars and galaxies forming over 13 billion years. One mystery is how the first supermassive black holes formed. With each galaxy, we discover these giant gravity wells, and astronomers are not sure how they get started. Webb detectors will also investigate and photograph planetary systems in formation around distant stars. It may even shed light on possibilities for Earth-like exoplanets. Finally, JWST will look for answers to two mysteries that make up 95 percent of the universe—dark matter and dark energy. 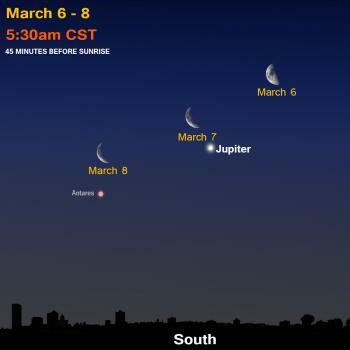 Jupiter rises before midnight by the end of March. Best to catch the king planet in the morning sky. On May 8, Jupiter will be opposite the Sun—like a full moon. It will rise at sunset and set at sunrise. This month, watch the Moon orbit by on the mornings of March 6-8. Mars and Saturn draw very close together this month. 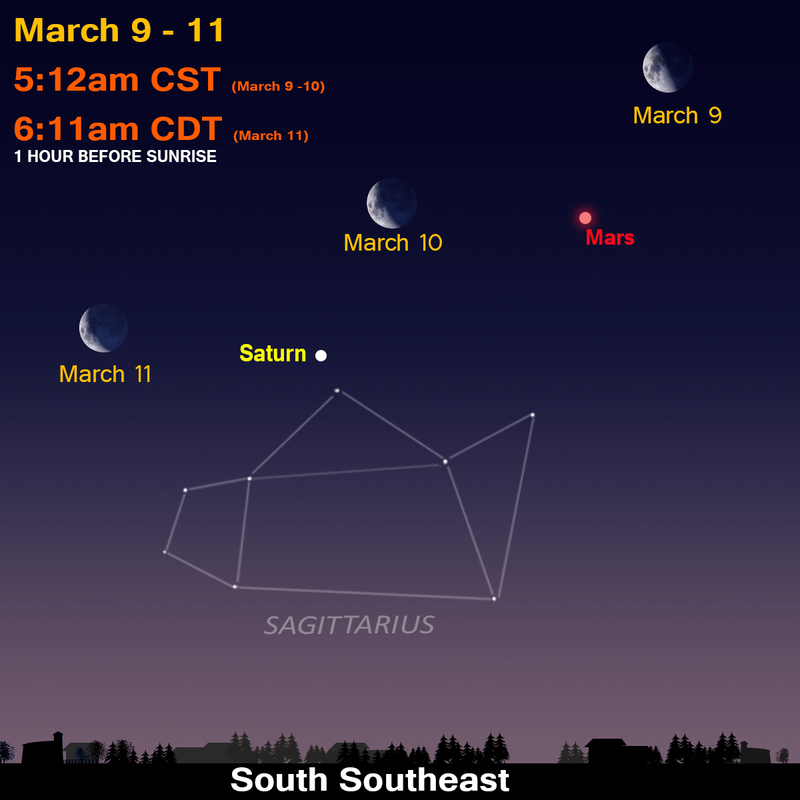 On March 1, Mars rises about 2:00 a.m. CDT. Saturn comes up 70 minutes later. 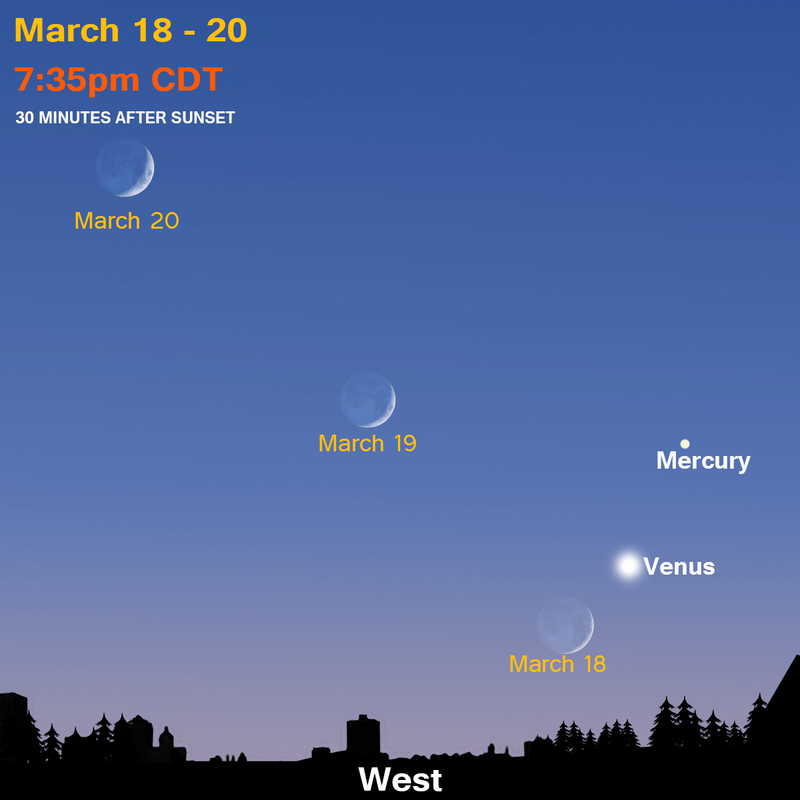 By March 31, the two planets clear the eastern horizon about the same time and are less than two degrees apart (the width of your thumbnail at arm’s-length held up against the sky). 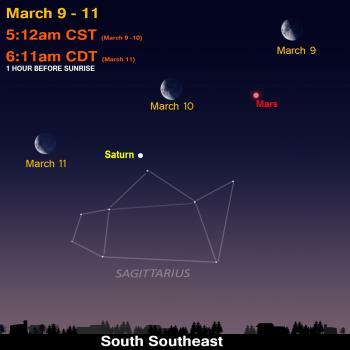 The Moon wanders by on the mornings of March 9-11. Notice the times on the sky chart for March 9-11 -- we “spring” ahead on Sunday morning, March 11! 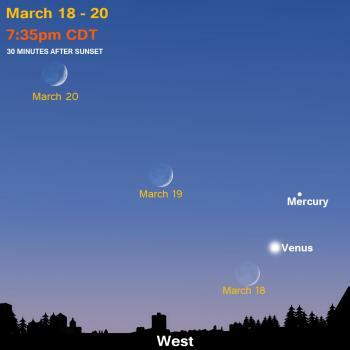 Venus and Mercury line up near each other for the first 3 weeks of March, low in the western evening sky. The inner planets will be elusive as they set less than one hour after the Sun. The brilliance of Venus makes it more accessible for planet-gazers with a clear path to the west sky. The Moon will help you locate the rocky worlds from March 18-20. Download the March Star Map.